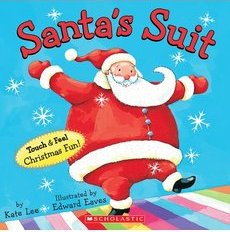 Santa’s Suit, written by Kate Lee and illustrated by Edward Eaves, is a rhyming story and a really lovely read for younger children. It would suit babies and children aged three to fours years old. Santa is bored with his red suit and thinks it’s time to try another colour. So he goes through all the colours of the rainbow, trying different textures, patterns and fabrics, but in the end decides that red was the best colour all along. Explore adjectives with your child as you read the story, and see if you can find something else that is pink and satiny, or green and prickly around the house. You could also try decorating a picture of Santa with your own special version of a colourful Santa Suit. Play dress ups with some old clothes, and ask your child to listen to what pieces of clothes to put on first, second, third and last (this activity works best with children aged four and five). Explore rhyming with your child by leaving off the second word in pair of rhyming words, and see if your child can guess that word to finish the page off. Watch out for our next (last!) Christmas book review and activities, and happy reading!